This week, for Monday we have a phylogenetic tree constructed using examples of the organisms whose relationships are being represented. 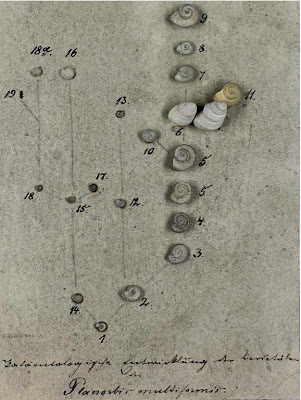 In 1867, Franz Martin Hilgendorf published the tree shown in the first figure, which is illustrated with pictures of the fossil snails being discussed. This may well have been the first time that this form of illustrated phylogeny was produced. 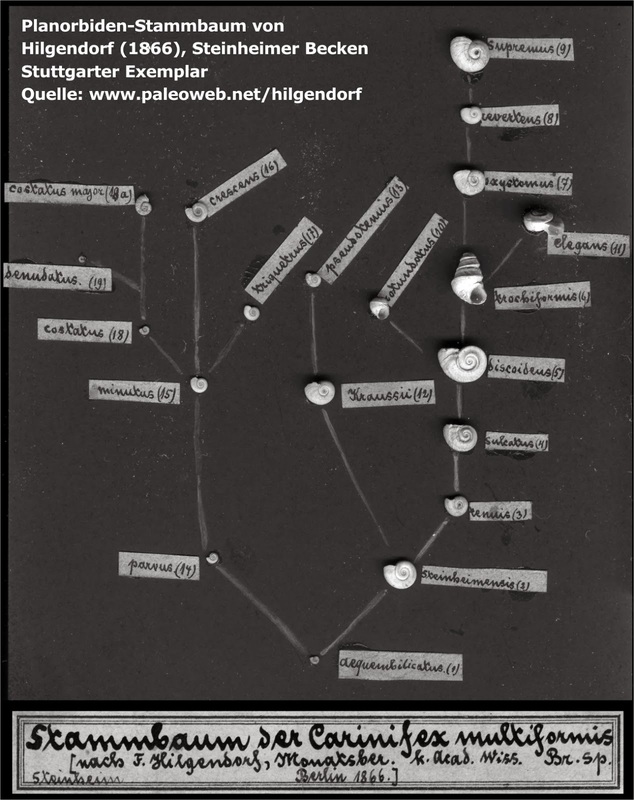 In 2000, Hilgendorf's papers and original fossil materials were re-discovered in the Palaeontological Collections of the Natural History Museum, Berlin, to which they had been donated by Hilgendorf's heirs. Among these was a series of cards to which snails had been glued, illustrating the morphological transitions within and between the taxa, as described in the original paper. One of these cards illustrates the phylogeny, as shown in the next figure. This is not the only example of this type produced by Hilgendorf. Another one had previously been discovered in the State Museum of Natural History, Stuttgart, as shown in the final figure. This copy was apparently produced much later. Rasser M.W. (2006) 140 Jahre Steinheimer Schnecken-Stammbaum: der älteste fossile Stammbaum aus heutiger Sicht. Geologica et Palaeontologica 40: 195-199.